Experience a world unlike any other, without the hassle of taking a course. Already a certified diver? Come and experience the caverns of Mexico with Cenote Xplore guide Cavern Experience. Cavern diving in the cenotes is available for all certified divers who would like to safely enjoy a unique and thrilling adventure. The cavern dives are conducted by a full cave diver IANTD. The guide is also a IANTD instructor. The perfect option for those with little time or who want to try cavern diving before committing to a course, a professional cavern guide will lead you through the stunning passages of the Yucatan’s cenotes. You will follow the reaches of sunlight and experience for yourself why Mexico draws divers from all over the world just to see these stunning natural wonders. The awe-inspiring formations and decorations are not exclusively for trained cave divers, much of the splendor of the cenotes can be found within reach of the cavern zone that your guide will show you. 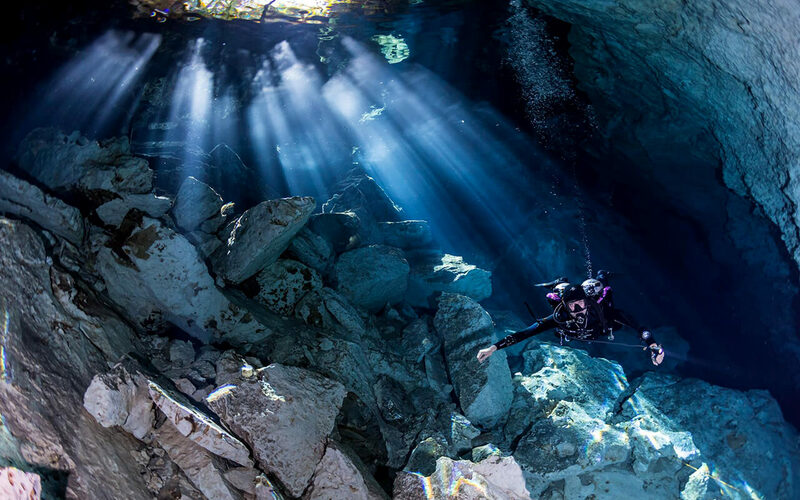 The number of divers in a cavern is limited to two for each certified guide. The dives are within the day light limits, and follow worldwide accepted standards. There are many places on the Riviera Maya that offer guided cavern dives, but few have guides with the knowledge, experience, and resources available to Cenote Xplore to ensure that your dive is an enjoyable and, above all, safe experience. Our guides have a proven track record of safety, experience, and professionalism, and are held to a very high standard of excellence in training so that you have the best possible experience.